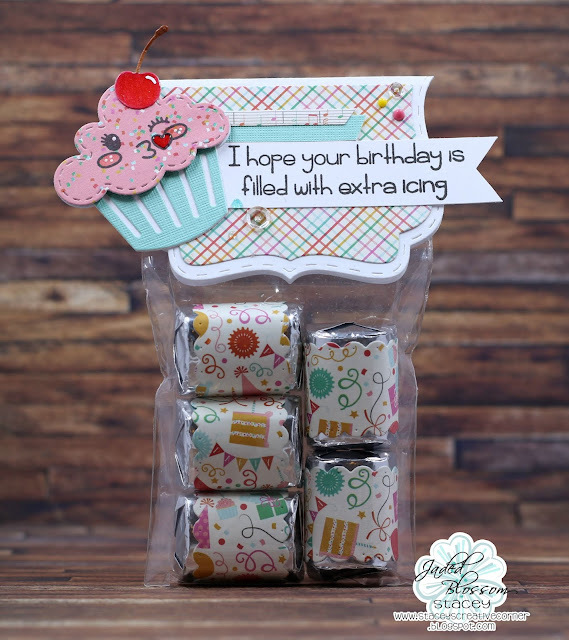 Stacey from Stacey's Creative Corner with you today sharing a super cute birthday set that I made using some fun Jaded Blossom stamps and dies! 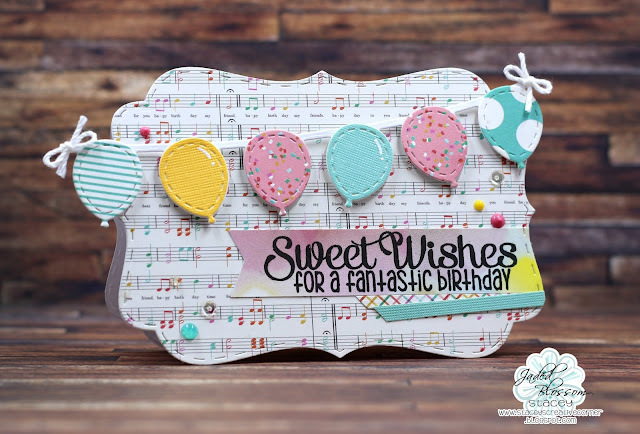 I love making shaped cards so I used the Fancy Topper Die to create my card base for this one. Fun right? I cut out two pieces and scored about a 1/4' down from the top on one of the pieces. I added some adhesive above the score line and simply adhered the two pieces together, making sure the scored piece was the back of the card. Easy peasy shaped card! I added a fun balloon string from the Balloon Dies and used the Nom Nom stamp set for my greeting. I finished off my card with some Nuvo drops, sequins and crochet thread bows. Of course I had to make a little treat to go with the card right?? I used the Candy Wrap Dies to wrap some chocolate candies and put them into a 3x4 clear bag. I used the Fancy Topper Die for my bag topper and decorated it with a greeting from the Nom Nom stamp set and a cupcake from the Birthday Dies. I added a face to my cupcake using the Sweet Faces stamp set. More sequins and Nuvo drops for finishing touches. Loove this!! That cupcake is too cute!! !